It must be time to Get Our Game On. The Packers and the Steelers will go head to head next Sunday. I’m really not partial to either team. I’ll pretend like I’m watching, as I flip the pages of my ipad. If I’m going to watch football, then snacking is an essential part of the game. You see . . . I figure if my jaws are moving, I won’t fall asleep. Popcorn & Oranges is my favorite sit down snack. If you’ve been invited to a Super Bowl Party, then you might need something a tad fancier. 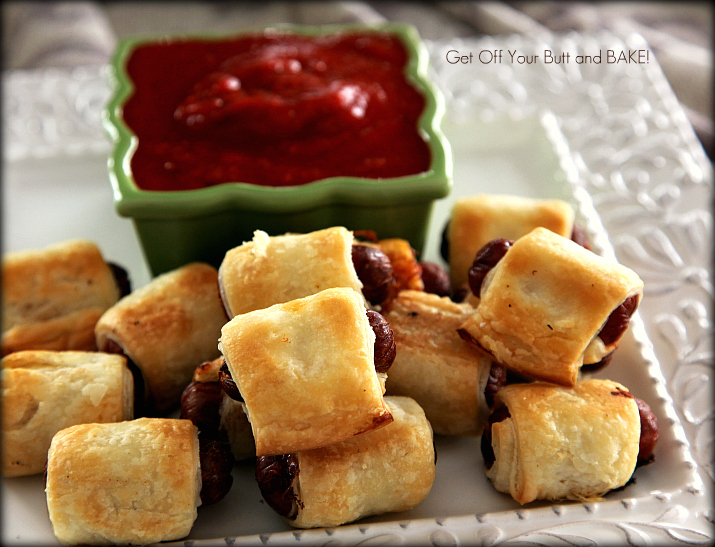 These Spicy Sausage & Cheese Bites or Little Pigs in a Blanket will surely keep your eyes peeled to the game! They are a cinch to make and even easier to eat. I’m sure you’ve made them before, with Crescent rolls . . . you know the kind that come in the tubes. Puff Pastry takes them from Take-out to 5 star deliciousness. You can even make them ahead of time and Pop them in the freezer for later. 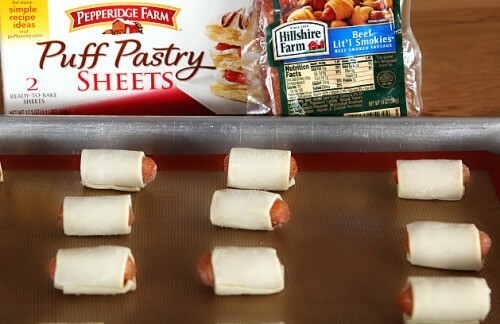 All you need is a box of Puff Pastry – & Lit’l Smokies. You can also use some good quality hot dogs and cut them into 4 sections before wrapping with pastry. Roll the pastry sheet into a 9×12-inch rectangle, and using a pizza wheel cut strips that are slightly shorter in width than your lil sausages. You want them long enough to wrap completely around. Tuck the tail underneath, when placing them on a parchment paper or silpat lined cookie sheet. Bake at 400 degrees, for about 15 minutes or until the pastry is nice and golden. You can even brush Egg wash over the Pastry before baking, if you like. This will give them a shiny golden top! Serve with Salsa, Pizza Sauce or maybe even Mustard & Ketchup. 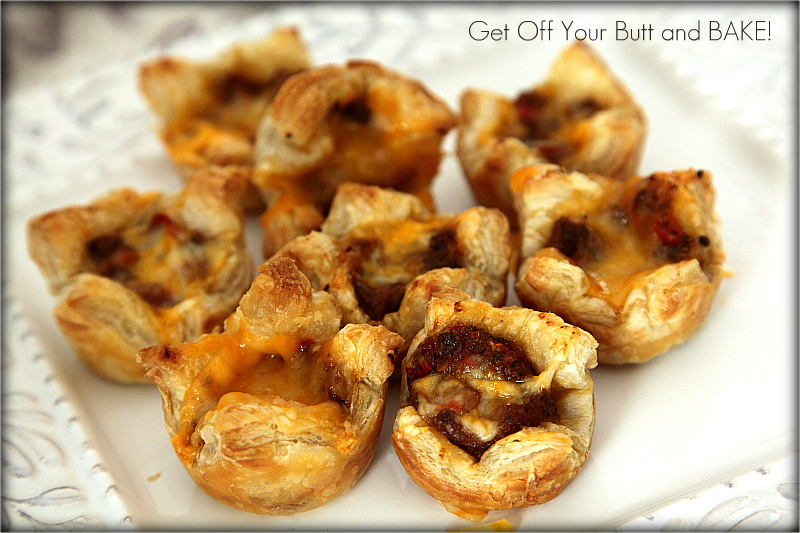 All you need is Puff Pastry – Sausage, Pizza Sauce or Salsa & Sun dried Tomatoes (opt) and grated Cheese. Brown your Sausage and drain really well. I like to squeeze all the grease out with paper towels. We like the Reduced fat! Once your Sausage is ready, add Pizza sauce or even Salsa, until it’s the consistency that you like. You can add additional spices, but the sauce I’m using has sufficient for our tastes. I chopped up some sun dried Tomatoes, and tossed them in as well. Roasted Red Pepper, Green Pepper or hotter jalepeno peppers would also be very good. In fact, below is a recipe for Jalapeño Poppers in a Blanket. They will keep you wide awake!!! Heat the oven to 400°F. Unfold the pastry on a lightly floured surface. Roll the pastry sheet into a 10×15-inch rectangle. Cut the pastry sheet into 24 (2 1/2-inch) squares. Press the pastry squares into 24 (1 3/4-inch) mini muffin-pan cups. Fills the mini cups with about your sausage mixture. You can fill them quite full, but leave enough room for some grated Pepper Jack or Mexican Cheddar Cheese. Bake them until they are golden brown around the edges . . . and the bottom. They will Puff up beautifully! 2 Tablespoons Parmesan Cheese (opt)Combine all ingredients in bowl and blend well. Unfold 1 pastry sheet on a lightly floured surface. Roll the pastry sheet into a 9×12-inch rectangle. Cut into 12 (3-inch) squares. Repeat with the remaining pastry sheet. I am the exact same way you are about the super bowl. I always go to super bowl parties for the company and the food. I also glance at the score now and then but my eyes are glued to the TV when the commercials come around! You don’t have to thaw them before baking, but they will require a bit longer baking time. If you do thaw them slightly before you bake them, make sure that the pastry is still very cold!